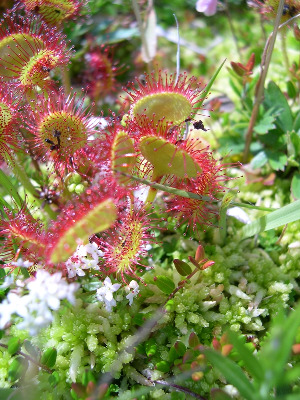 Bogs, fens, and cedar swamps, usually on sphagnum hummocks or mossy logs; also on moist sands (including excavations) and mossy crevices in rocks. The petioles are ± pubescent with loose crooked hairs, sometimes a helpful character with depauperate vegetative specimens that one might otherwise confuse with D. intermedia, which has glabrous petioles. See notes under. D. intermedia. MICHIGAN FLORA ONLINE. A. A. Reznicek, E. G. Voss, & B. S. Walters. February 2011. University of Michigan. Web. 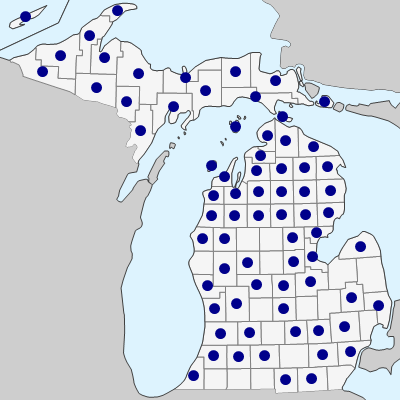 April 21, 2019. https://michiganflora.net/species.aspx?id=1178.